Ok, everyone, I get it. The Cronut has goaded our hubris, and now our sudden compulsion to create decadent food-mutants has gotten the best of us. Is this the new phase of enlightened human consciousness, or will it end terribly (with a rioting hoard of angry villagers chasing a croissantwich into a windmill and then, carried away by their own violent compulsions, proceeding to raze to the ground civilization as we know it)? I guess that only time will tell. Our new attempt to play food-God has yielded this: the Carl's, Jr. pop tart ice cream sandwich. The dessert dish, kind of self-explanatorily, consists of a scoop of vanilla ice cream wedged between two strawberry pop tarts. Because it is exactly like something one would dream up while drunkenly rooting through the fridge of their college roommates, it is both ghastly and marvelous. 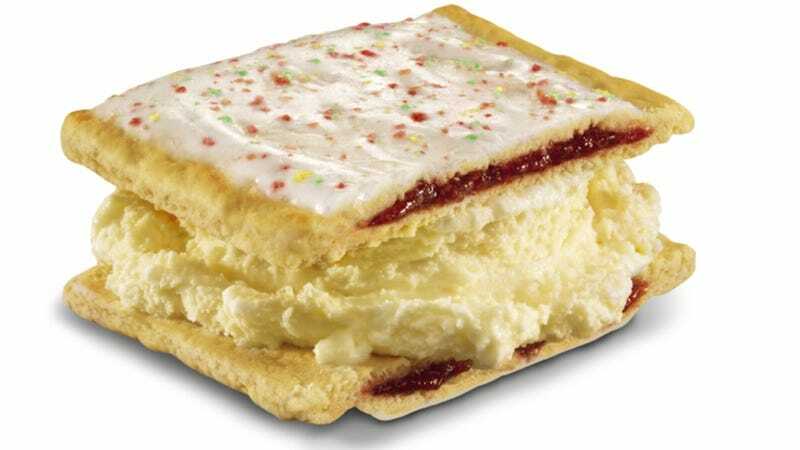 Other things you would invent in the state of mind required to dream up a pop tart ice cream sandwich: mozzarella sticks with mashed potatoes on the inside, a pie filled with chopped up bits of cake, pouring Go-Gurt into a beer funnel. The "dish" was first tested in Orange County, CA, this spring, where Marissa Cooper's wayward spirit probably okayed it for nationwide distribution. As of yesterday, Carl's, Jr. has decided that everyone else near one of its many chain outlets should give it a try. So you may now purchase this beautiful abomination for $1.49, if you are so inclined.